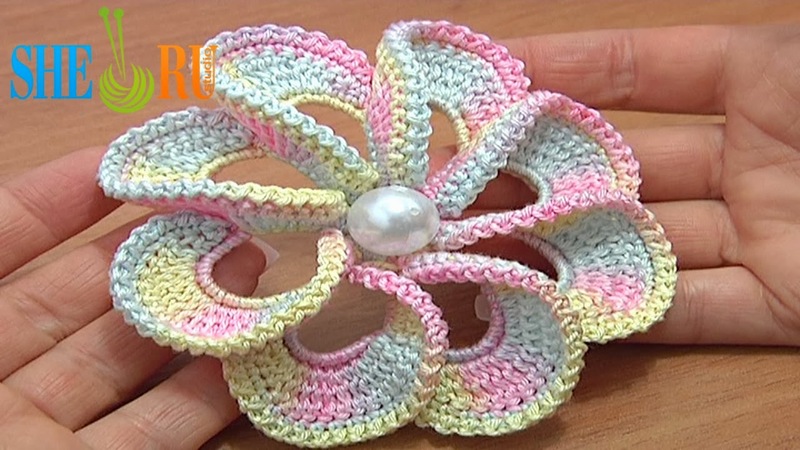 Begin to crochet with our free crochet flower tutorials. This crochet spiral flower has 8 petlas. To make the petal we work single crochet stitches into the chain space and arund the trebele post. Then continue in rows until we coplete the petal. Around each petal we work a trim of slip and chain stitches. Decorate the flower with a pearl. Thanks for watching! To make this crochet flower use the yarn 100% Cotton, 169m/50g; and Steel Crochet Hook 1.5mm или 2mm (#8 or #4 US standards). Sheru, this flower looks very complicated. How do you fold the petals to the right? Can you teach me? The flower is really cool and sounds complicated. Can you teach me how to fold the petals to the right side?